Eat and the world eats with you, eat, and you eat alone. There’s this phenomenon in South Korea called Mukbang. Simply put, individuals go on webcam and document themselves eating a feast. They’re not naked or anything, and there’s no sexual connotations. They’re simply going through the motions of eating, describing the delicacies, and talking with their followers about who-knows-what. “A lot of my viewers are on diets and they say they live vicariously through me, or they are hospital patients who only have access to hospital food so they also watch my broadcasts to see me eat.” – The Diva, in an interview with CNN. People are lonely. It seems South Koreans are pretty lonely as well. My ‘The Housewife‘ was lonely. I’m pretty lonely, we’re all pretty lonely. Some people are partaking in Mukbang because they feel like they’re eating with somebody else. As they sit there, in their pyjamas and untamed hair, they poke and prod at their microwave meal while looking into the eyes of a potential companion hidden behind a 16:9 monitor. How’s the chicken? she types to her digital friend. 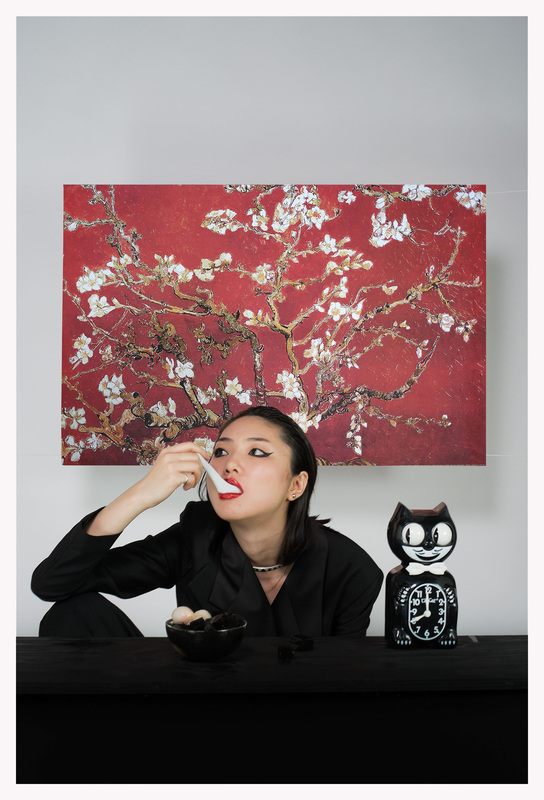 Eating is a strangely intimate ritual. Some will eat with shoulders hunched forward, face close to their plate, powering through as if it were their last. Some pick at their food methodically, working out in their heads how to best savour each bite and even more importantly, what mix the final bite might consist of. “Have I left enough caramelised onions for my final bite of bloody steak? Have I mastered the even spread of dip between my Dairylea dunkers?”. I went for ramen with a friend earlier this year at this amazing restaurant called Kanada-Ya. We talked and talked and talked until we were sat, miniature menu in hand. The food came, and along with it a silence that loomed until the very last noodle was slurped up. There was the sole focus of eating and enjoying her bowl of fragrant ramen, and I sat there with no choice but to mirror her trance myself. 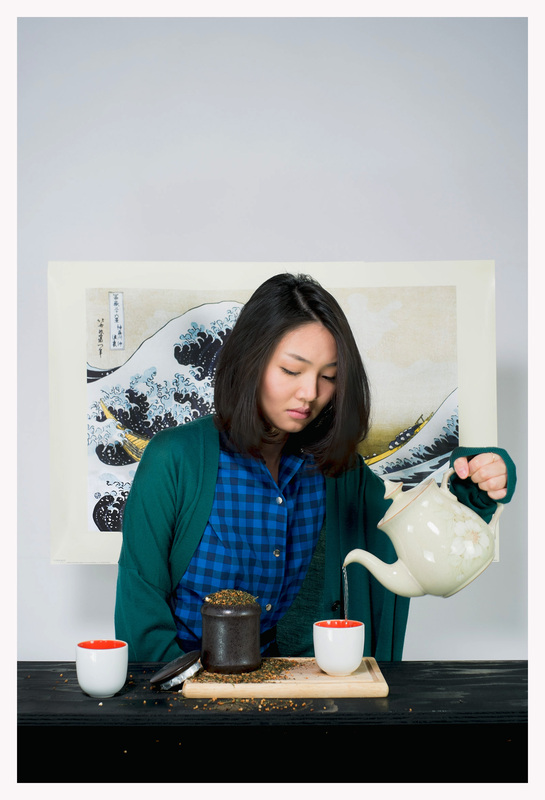 Rae drinks Genmaicha tea. Served after a few minutes, brewed with hot – not boiling – water. It seems odd that I have never noticed the personal nature and peculiarities of eating. I suppose we’ve gone through our whole lives doing it as we would walk or sleep. The ramen girl joked with me about our sad lonely lives, fuelled by sad lonely meals, like instant noodles or plain pasta. Food which has one goal to fulfil and that’s sustenance. The kind of food you eat without thinking, because there’s no one to share it with and therefore no one to impress nor please. I imagine these are the kind of meals that drive people to watch Mukbang. A single bland, non-intimate, eaten-in-solitude ration. Meals end up infinitely more exciting when we share them with someone else, with food tasting better and the comparisons remaining primarily positive. It’s hard to be bitter when good food meets good people. 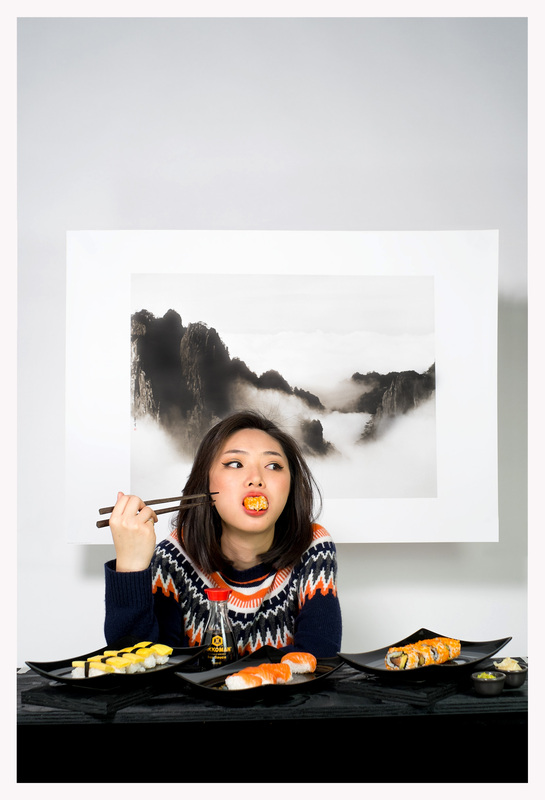 Rae eats tamago (egg) nigiri, salmon nigiri and tuna ura maki (I think…). It is recommended only the fish part of the nigiri touches the soy sauce, and you’re not meant to shake it. Ginger is there to cleanse the palette, not be dipped in the soy nor mixed with the sushi. In London, we’ve certainly overlooked the pleasures of eating, doing everything we do with half-assed efforts and double-time pace. Soggy sandwiches and the meal deals they come with are devoured over greasy keyboards, and if it’s not our computer mouse in one hand with a chicken & avocado special, it’s most likely our phones, because we couldn’t possibly divert our attention to just doing one thing. Or perhaps eating has become exactly that, a mindless routine similar to that of our commute to work. My brain tells me I’m hungry, the same way it tells me I need to get the Victoria line to Highbury & Islington to catch my train to Dalston. I suppose that’s maybe one of the reasons I’ve loved Italy or France, where lunch seems an experience and a thoroughly appreciated time of the day. Wining and dining with others, socialising and discussing rather than social media-ing and Googling. Rae eats cha siu (marinated pork) and rice. I was once ridiculed for eating rice with a spoon once. It is not for the “commoners”, as he believed. Rae is drinking soju (Korean alcohol, with a similar taste to Japanese sake). Don’t drink with South Koreans. They’ll drink you under the table. I met Rae through recommendation of a friend, and she ended up modelling for one of his shoots which I was assisting on. A few food&drinks later she agreed to model for this food shoot I’d be planning. 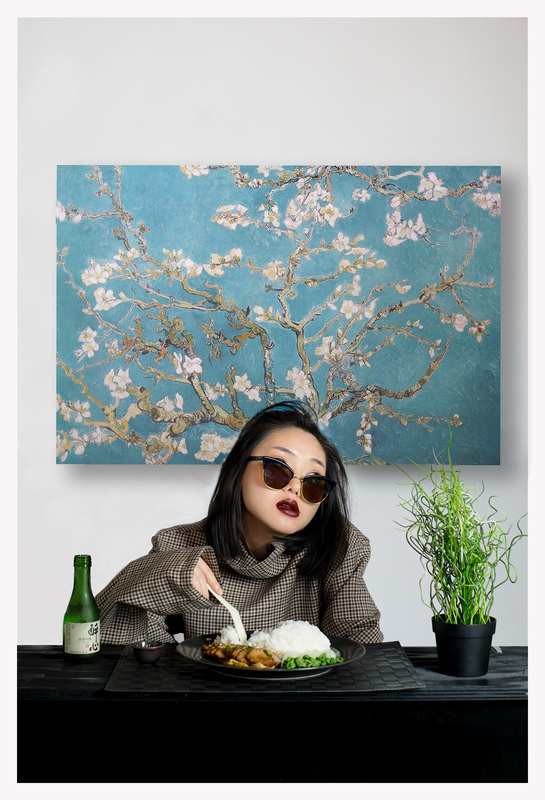 Simple, I thought it’d be, with a standard portrait set up and a girl eating some food in shots. Not so simple, it ended up being, as instructing someone to eat on camera “as if they were someone else” ends up becoming incredibly unnatural. Rae is one of those who picks at her food methodically, slowly but surely working her way through a meal without much care for the world. 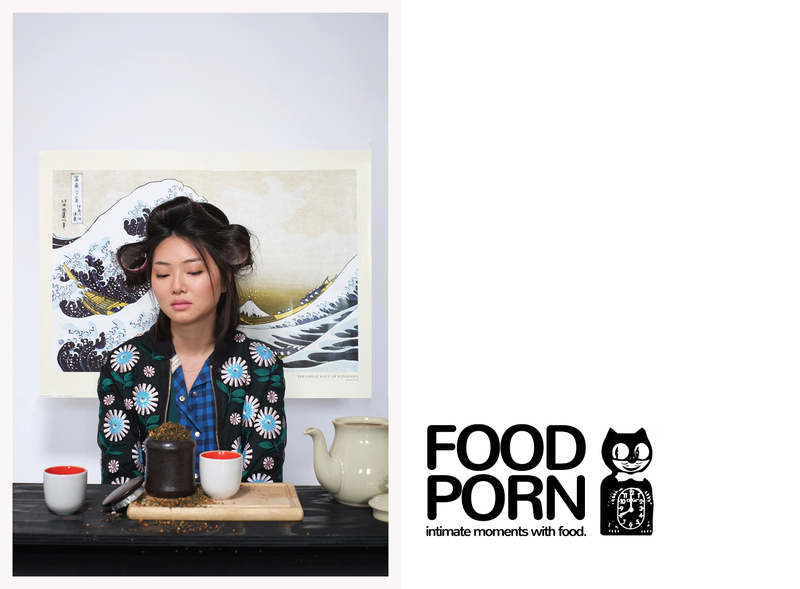 She eats as an introvert, and when she was asked to present the food to the camera it looked like some glossy Chinese beauty tea billboard. You end up forgetting that eating is such a natural, different and personal experience for everyone, and telling someone to change the way they eat is like telling them to stop biting their nails. It’s habitual. Rae is eating black grass jelly. Mostly tasteless, unlike its other black jelly companion, guilinggao aka tortoise jelly. Guilinggao used to be made with actual turtle shells, but now it is mostly herbal based. It’s bitter, but tastes great with sugar syrup.